Bangalore is home to thousands of restaurants. Its tough selecting the best and most unique amongst them. The criteria I have used is based on Longevity, Consistency and Uniqueness. These are the Nine Jewels – the 9 Must visit restaurants in Bangalore. The first 5 are legendary – they are part of Bangalore’s history. Many have been around for more than 50 years. They are located in Old Bangalore – Malleswaram, Basavangudi & Lalbagh. All of them serve authentic Karnataka taste S Indian food . Most of them are Tiffin joints serving traditional Karnataka tasting food. (Yes the taste of Sambar and Chutney changes across the 4 South Indian states). These places are always crowded, service is fast & effecient and they are very affordable. BMW’s and Mercs line up outside these shops and don’t be surprised if you bump into Rajnikanth, Puneet Rajkumar or the Padukone family. The Next 3 are unique new ones run by passionate entrepreneurs. They serve healthy food – Vegan, Millet based food in a lovely ambience. They are also located in traditional Kannadiga localities of JP Nagar, Jaynagar and Sadashivnagar. The lone North Indian Restaurant – In a city packed with Italian, Chinese and Continental restaurants its difficult to find a good authentic North India restaurant. It was a close call between two restaurants and I finally chose the newer one because of its brightness and positive energy. The First 5 : Traditional and legendary, They are timeless. A small standing joint spread across 150 sft it dates back to 1977 . It all started when Suryanarayana Hegde moved to Bangalore from Sirsi as a 10-year-old after the death of his parents. After working as a cook for 10 year in a doctors house he started his own restaurant on Sampige Road. That closed due to labour problems. He then started Veena Stores with mainly condiments and a limited menu of coffee, tea, badam milk and Idlis.His son Pradeep a diploma in electrical engineering joined the business in 1987. Pradeep now runs the restaurant with his wife. Veena Stores serves a limited menu – Fluffy soft Idlis, Vada, Khara Bath, Kesari, Pongal, Lemon Rice, Puliyogare, Coffee all of this served fresh and piping hot. The Savige (Vermicelli) is the best. The Mint Chutney they serve is a hit. (The restaurant does not serve Sambar). Very reasonable priced all dishes are in the 20 – 30Rs range. Sumptuous breakfast for 2 will be less than Rs 150/-. Good to know Kannada while ordering and please go with a driver as parking is a challenge. Located on the main road you enter the restaurant walking by a street full of fragrant flowers. 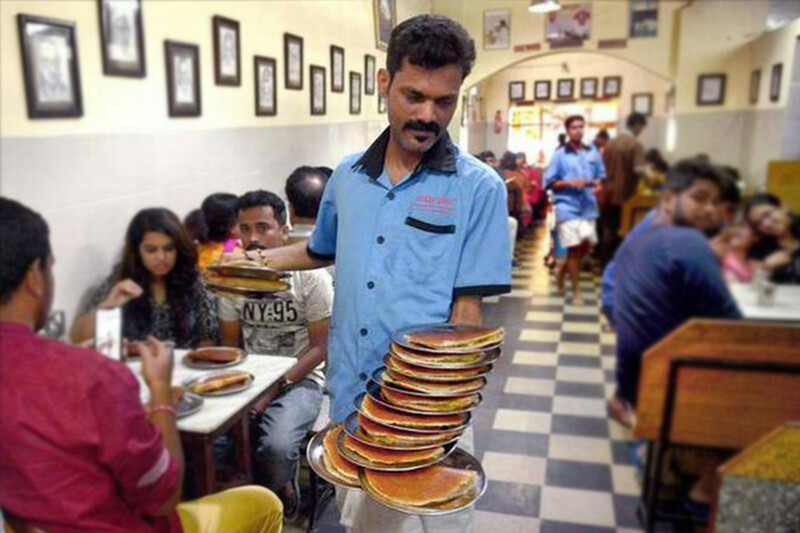 “Vidyarthi Bhavan was primarily started for students, as the name suggests, but its popularity increased, and today we have celebrities from all fields who brainstorm over our dosas and coffee,” says Arun Kumar Adiga, who runs Vidyarthi Bhavan. On weekends there are over 3000 walk ins as people wait patiently for the seats to be freed up. The wait is worth it – The dosas are rich and soaked in butter. To this day, six dishes on Vidyarthi Bhavan’s menu — benne (butter) masala dose (along with saagu-masale), puri-saagu, idli sambar, uppittu, chow-chow bath and rave vade have celebrity status! And its been consistent over the years. MTR needs no introduction. Lalbagh, Cubbon Park, Vidhan Soudha and MTR are the 4 pillars that define Bangalore. There are many MTR restaurants in town and abroad but I am referring to the iconic 1st branch near Lalbagh. The others are no match to the original one. Started in 1924 the restaurant is spread across 2 floors and has a lot of seating. There are even rooms that can be reserved for families. The food served at the MTR is all veg, Karnataka Brahmin fare and owes its origin to the Udupi Cuisine of coastal Karnataka. The decor is old age. For many years, the customers entered the restaurant through the kitchen so that they would be able to satisfy themselves about the restaurant’s cleanliness before they ate there. During WW 2, MTR found it difficult to make Idlis, since rice was in short supply. They experimented with Semolina instead of rice and thus invented the very popular breakfast item of Rava Idli. The Tiffin here is wonderful and over the weekends its customary for Bangaloreans to go for a walk in Lalbagh and then Q up for breakfast at MTR. However if you are visiting for the 1st time visit them for Lunch. Its an elaborate multiple course meal with unlimited servings and you will struggle to complete it. Important to note that they are Closed on Mondays. Paid 3rd party Car parking is available diagonally opposite. The Next 3 : Unique, Healthy Food run by passionate entrepreneurs. These are not as well known as the earlier 5. They are a new age of restaurants promoting healthy food. They have a lovely ambience, tasty food and are reasonably priced. After the rich fare with dosas soaked in butter in the above 5 restaurants – the light and healthy food here will be a refreshing change. A classy Vegan Restaurant at Sadashivnagar it serves Vegan food without Oil, Dairy products, Refined Products like Maida, Sugar etc. Serves a variety of tasty and healthy continental dishes from Nachos, Sandwiches, Sizzlers to Pizzas and Asian Bowls. The idea is to appeal to the younger generation. The ambience is calm and serene. the place also has a Meditation Room and the only Svara (Sound Healing) room outside of Auroville. Servings are large and a meal for two costs about Rs 1000. Located at JP Nagar this place serves a wide variety of dishes – from Cutlets to Thali and everything cooked here is mad with Millets or Red Rice. Jyoti the owner is passionate about furthering the cause of Millets and after years of seeing the benefit in her family has started this restaurant to espouse the cause. the signature dish is their Thali. The store also sells handicraft , ladies handloom clothes, and organic products. A calm and quiet place on weekdays – it can get busy on weekends. This is another Millet only food restaurant that serves a wide variety of dishes that look and taste like regular S Indian dishes made with rice. All of this served in a rustic village ambience. The Dosas, Vadas, Paddu’s are all made of Millets. They also have Rotis of all the main millets served with curry. Thali options are available at lunch. The water that is served tastes like the “Teertham” you get in a temple – mixed with Camphor, Tulsi, Clove & Cardamom. The Matka Kulfi was also very tasty. At the end of the meal they give you a concoction “Kashayam” to improve your digestion. Its a very affordable place. Between four of us we ordered 2 plates of Paddu’s (Kuzhi Paniyaram), 2 Dosas , all the 4 Varieties of Millet Roti’s with Sabji and Kulfi and the bill was only Rs 884/-. After so many S Indian fares I had to include one North Indian restaurant. In the new Bangalore areas of Indiranagar , Koramangla and Sarjapur you will struggle to find a good North Indian restaurant. All you see is Pubs , Italian, Chinese, Continental , Sandwich cafes, Coffe Bars etc. I have always felt that Tandoor in MG Road was the best bet for North Indian food. Good variety, authentic N Indian, consistent quality and great service. But I recently found a place that had all this with 2 additional advantages – A bright ambience full of positive energy and a wider variety of dishes. This place is Urban Tamasha a newly opened restaurant at Indranagar. The North India food and starters were great – they also have Pasta, Noodles and Pizza options – which works out very well when you go with the younger generation. Non veg dishes available. Lunch has a buffet option. No Alcohol is served. At the end of every presentation the legendary Steve Jobs used to have a slide titled “One more thing” – having worked in Apple I will take that learning from him and add one more restaurant to this list. This is where I have been going Traditional restaurants of bangafor breakfast once a week for many years. And it would not be fair not to include it. Located in Koramangla next to Anand Sweets its the only restaurant that serves authentic Tamil Nadu style food. Idlis, Upma, Pongal, Dosas for breakfast and evening tiffin and plantain leaf lunch. The Sambar here is distinctively different from the other restaurants listed above. Its like a mess – always crowded with regulars.